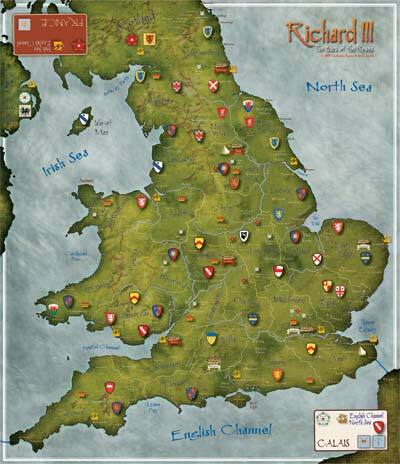 Richard III is a wargame reflecting the "Wars of the Roses", whereas one player starts as King (Lancaster) and the other player as the pretender (York). Over three campaigns you have to work on "owning" as many nobles as possible to get their votes and to be finally crowned King of England - and win the game. The game comes with a very nice map of England, which (although not mounted) can be laid out pretty flat and serves its purpose very well. Additionally you get at about 60 blocks (and a sheet with stickers for them), 25 cards, the rules and a couple of dice. A fine package. The game lasts for three campaigns with seven turns each. You are dealt seven cards per campaign, which have to be used for recruiting and moving your armies. Afterwards battles are resolved by a simple and quite elegant system, offering also some twists. Beside influencing nobles to change sides, you also have to take care of the heirs and the variable entry points for nobles. The game mechanics are similar to the successful block game "Hammer of the Scots" (also published by Columbia Games), whereas I have to admit that in my opinion Richard III is even more accessible and a bit simpler. Nevertheless it offers a lot of strategic depth in gameplay, so you will have a hard time taking your decisions. It will hit the table quite often as it can be finished in 90-120 minutes - which is rare for such kind of games. So it might be also a good choice to start with if you are new to (block) war games, maybe it's even interesting for Euro gamers. 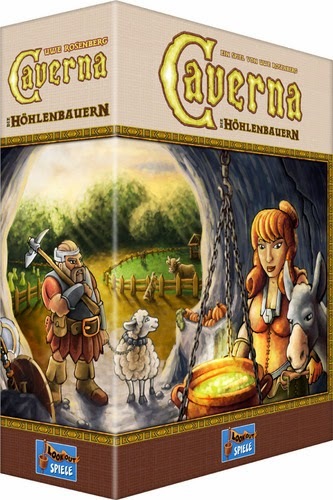 Great and exciting game with the typical "Fog-of-War" feeling already known from the other fine Columbia block games. Fromt the publisher: Richard the Third is an epic two-player game that recreates the 15th century, bloody dynastic struggle between the royal houses of Lancaster and York for the throne of England. Will the mad-king Henry VI and his Queen Margaret keep the throne or will the Duke of York recover it for the Plantagenets. Also strutting across the game's stage are Edward IV, Richard III, Henry VII, and Warwick, the notorious "Kingmaker".